Just like last year, the most popular and successful science fiction movie franchise of all time has given fans yet another early Christmas present. Rogue One: A Star Wars Story is directed by Gareth Edwards (2014s Godzilla) and stands alone as the first movie in what is now being called the Star Wars Anthology series. I always liked the original Star Wars trilogy and continue to respect The Empire Strikes Back in particular as one of the greatest films ever made. However, The Force Awakens actually made me a Star Wars fan, being my number one film of last year and my favorite installment of the franchise. All of that being said, I was beyond excited to see what this new movie would bring to the table. 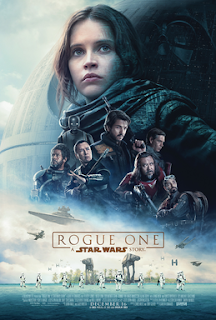 Rogue One takes place before the events of the original Star Wars movie, leading directly into the events of the 1977 classic that started it all. The film is about the Rebel Alliance’s risky mission to steal the plans for the first Death Star, a space station with the power to destroy an entire planet. Galen Erso (Mads Mikkelsen) was the unwilling designer of the massive weapon and is captured by the Empire to finish what he started. Fifteen years after this, the Rebel Alliance recruits his criminal daughter, Jyn Erso (Felicity Jones) as the first step of their quest to track down her father and retrieve the secret plans he made to destroy the Death Star. Rogue One is far different than any other Star Wars film, made quite clear by the fact that it strays from the Skywalker-based story that fans have become accustomed to in the episodes. That being said, it requires a bit more attention to detail and knowledge of the vast universe than the other films have. All of this considered, I still had a blast watching this movie and really loved this fresh take on the iconic universe. While it has a relatively slow buildup, the last act of Rogue One has a huge payoff in the form of what I think is the best battle scene in the series to date. It was also amazing to hear the legendary James Earl Jones voice Darth Vader once more in some of the film’s best moments. Overall, I would say that Rogue One is an excellent addition to the Star Wars universe that certainly shouldn’t be missed.